The Truth About Basically Everything: Why ask why? Over the weekend we took a fun little vaycay to Wyoming. Okay, that is a lie - it was longer than a weekend, it wasn't fun, and it wasn't a vacation. We did, however, go to Wyoming. I think it is significant that the first part of the word "Wyoming" is "why". It must have something to do with the following questions: Why would anyone go there? Why would anyone live there? Why does it even exist? I can't tell you. All I can tell you is that I am glad to be home, and not there anymore. To be fair, I guess I should say that some parts of Wyoming are nice, like Jackson and, well, pretty much only Jackson. On the other end of the spectrum you have Rawlins, which is where we were camped for five days in a fine gravel parking lot, I mean KOA, whilst Jason hunted for deer and antelope. I have to tell you that I was against this trip from the beginning. For the past eight or nine months, Jason has said, "And then in the fall, we'll spend a week in Rawlins camping as a family!" To which I would reply, "Yeah, that will be great, let's just talk about it later," all the while planning to tell him the night before that I had no intention of going. That is my tactic for avoiding contention: put it off till the last minute, duke it out, end up going anyway, but at least he knows I'm not happy about it. I don't know why I'm still using this tactic, because in seven years it has never worked, but it's pretty much all I've got. But back to the story. From Lehi to Rawlins is approximately five hours. It took us almost eight. Let me emphasize that again, IT TOOK US ALMOST EIGHT. From a fussy baby, to an unsympathetic police man (who knew you could get $100 ticket in Wyoming for not getting in the left lane when passing a cop who has already pulled someone else over? And how did he catch up to us that fast? Oh yeah, we were pulling a trailer up a hill at about 30 miles per hour. Way to target the weakling, Officer...), to running out of gas four miles short of our destination, it was basically a whirlwind of hell. Sorry for the language, Mom, but it's true. I don't even think she reads my blog anyway, so what am I worried about. I may as well just let it all hang out. It wasn't all negative, though. The trailer never actually blew over, which was surprising. The kids had a great time. Dallin and Luke went out with Jason for a few hours each day and loved it. Abby and I got a lot of reading done. We all watched movies at night, and ate a lot of greasy truck-stop food. On Monday, we discovered how to hook up the Internet, so things were much better after that. I know I need to have a better attitude, but sometimes it is just more fun to be right... One cool thing though, was that we saw wild horses. 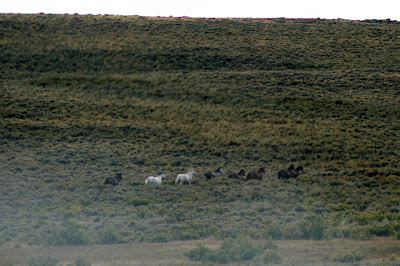 This is only the second time in my life that I have seen wild horses. 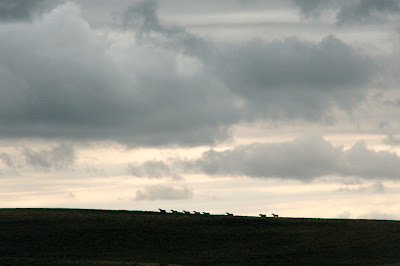 We were out driving around as a family, looking for antelope, and we saw a whole herd running across the desert. They ran until they were on the skyline, which was really cool to see. We just fit right in, there in "Rawlings". LOL-- The camo pic is priceless...I totally understand!!! I HAD to camp in Wyoming too this summer, and about went insane. Its a good thing our kids' have fun so we don't go insane. Glad you are home!! Did you have to bring home a dead animal? Oh man I'm bummed I missed dinner because I SOOOO wanted to hear about your trip. Way to look at the positives "The trailer didn't blow over" haha I was dying at that. And yeah Jackson is the only good part of Wyoming. Glad you at least stayed at the KOA so there were some facilities! Oh wow - I"m sure you'll have great memories of the trip later that you can all laugh about. And great pic! By the way - it is actually a law in Utah that you have to change lanes (where possible) when a police officer has someone pulled over. Lehi has actually started enforcing it too! I loved your post!! I was so excited to see you'd written one.... I've missed you!! I had no idea you were in Wyoming!! I'm not a fan of Wyoming at ALL. (sorry to be rude...) When a friend and I drove a car home from New York one summer, the car had problems in Wyoming and I was stuck there, by myself, for 4 days in some great motel. It was NOT fun. Oh well, at least you got some reading done!! :o) I like the picture of Jason and your kids though. It's so stinking cute. They're little faces are adorable!! Talk to you soon!! You are so funny. I always love reading your posts. See, the difference between you and I is that I would have demanded a hotel room if I was going to be alone all day in a little podunk town. Good for you for being supportive. Sorry I missed the glitter toe party. Definately next time. You make me laugh! I'm glad you survived. I got a ticket in Wyoming too [a few years ago]. They had no compassion then either!! I love it! The picture is so cute of the little fam. Oh girl I feel your pain. My husband is an AVID hunter as well. It's a joke and luckily for me I got out of going on the hunt this year cause I have this brand new baby. Thank heavens. Close call this year, what'll be my excuse next year and the next and the next?!? So funny. Anyways, at least you were a good sport! I am really not a camper, but I really Love Jackson Hole. Paul and I went there 2001 BC - Before Children. We went kayaking,river rafting, oh it was fun! . I am sorry to hear about the ticket. Yeah, who knew right?You are so cute apologizing for the language to your Mom. I have posted to many "not so many nice words" well not to that extent you know what I mean. Also posted pics of the movies I watched like SATC. And my Mom and MIL read my blog. crazy.And the pics, priceless!! 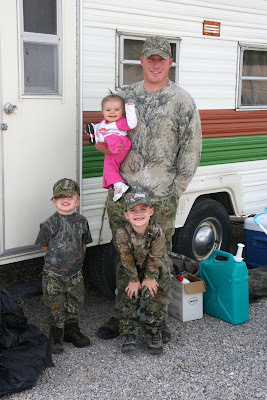 I love your little guys in the camo outfit. They look like they were having fun. Great that you got away and got some reading done but sorry that Wyoming wasn't as appealing. I loved the wild horses pictures. Yeah, did Jason get anything? My hubby is leaving to go hunting tonight. He is ecstatic. Me on the other hand not so ecstatic. Oh well. Love the kids all decked out in their camo and glad you survived. Oh Anne Marie! So sorry you had to go through all that. Sounds like torture! (To me at least. I am NOT outdoorsy in the least!) You survived and the kiddos had fun so still a success. Next trip, you pick the destination! Thanks for your book order. I'm glad you got to get some fun books. I can't believe you guys got a ticket for not getting over. LAME! I would totally fight it! Sounds like a great trip. haha. It could have been worse right? Your family looks like they are having fun. Cute pic. So when the locusts, famine, fire, pestilence, etc come, people in WY won't know the difference because they are already living it! I HATE WY 2! I went there is college w/my roommate (who was from Greybull) and I was like, "why does anyone live here in hell?". HATE IT! I was laughing the whole time. You are so funny!!! Love the camo pic. Yuck. I hate Wyoming too. Unless I am in Jackson, it's just bad memories. I am so sorry. I thought for sure once you saw our beautiful trailer that would get you out of the trip for sure. You are my hero. I don't think I can ever go back to good ol' Rawlings. I have the same feeling about out trip coming up. I don't want to go but I have to. I agree with everything about Wyoming. Boring.You're hilarious. You are such a good sport. I agree with the Wyoming "Why". At least you had a trailer to stay in right?